P&O Cruises | Frequently Asked Questions | On Shore - Can I use on board credit to pay for shore excursions? You are here: Home > Advice centre > Shore Excursions > Can I use on board credit to pay for shore excursions? Q. Can I use on board credit to pay for shore excursions? If you choose to pre book shore excursions, then you must pay for these at time of booking. This can be done via the Cruise Personaliser and you must have a valid credit or debit card to do so. You may book shore excursions once you are on board and these will be charged to your on board account, which will be settled at the end of your cruise. If you have on board credit then this is deducted from the balance of your on board account so you are therefore able to effectively use any on board credit given to you to pay for your excursions. However please note that your chosen shore excursion may no longer be available. 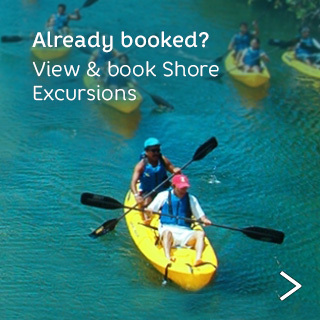 Booking shore excursions on board may result in higher prices than if you were to pre book them. If you wish to book an accessible shore excursion, this will be charged to your on board account as it is not possible to book these on line. How long does a shore excursion last? How do I know if a shore excursion is right for me?